People looking to attract birds to their garden may wish to carry out DIY projects to install feeders after one expert highlighted the products. Kirsi Peck, wildlife advisor for the Royal Society for the Protection of Birds (RSPB), said that adding a few feeders across gardens can bring birds in. “Regularly clean the bird feeders and make sure there is no uneaten food and droppings mixing together – basic hygiene to make sure you don’t get any bacterial or viral infections turning up,” Ms Peck recommended. Earlier this year, a report from insurance comparison website GoCompare.com found that three-quarters of Britons plan to undertake some sort of garden project in 2010. Squirrels are just one species of wildlife that is attracted to the mulberry tree. Youngsters love mulberries as much as do birds. Mulberries, though, are relished by many species of wildlife and by birds, just as much as bird feeders. Mulberry trees provide food during the nesting season along with shelter and nesting sites for dozens of species of birds, including robins, bluebirds, cardinals, catbirds, mockingbirds, cedar waxwings, orioles, tanagers and vireos, according to Cornell. If you have had any trouble attracting birds to your backyard you may want to consider adding a bird bath to your repertoire. It is true birds typically do not have trouble finding natural sources of water, but backyard bird watching can be significantly improved with the addition of a water feature in your yard. Birdbaths range in price and design. You can purchase cobblestone, terra cotta, ceramic, or copper birdbaths. While we may want our birdbaths to be beautiful our feathered friends do not know or care if they are drinking and bathing in a designer birdbath. A birdbath can be a receptacle or any dish-shaped object that holds water for birds to access. Bird baths are usually effective enticements and are easy to install. Rather than purchasing a birdbath you may decide to construct a birdbath. It is always important to consider space limitations. 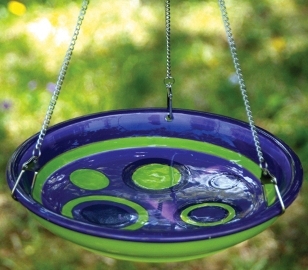 If space is an issue in your backyard, you should probably think of building a hanging bird bath. Hanging birdbaths can definitely be one of the most unique type of birdbaths. They are made up of a basin that is attached to several cords or chains and are hung to tree branches or custom-made garden hooks. Drill four holes around and at the top of your bowl. Cut four iron chains with equal length. Attach one end of each chain to the holes in the bowl. Paste or attach the weight at the back of your bowl. Connect the tip to the hook. Put decorations as you prefer at the sides of the bowl and around the chains. Find a nice spot to hang your newly constructed bird bath. That’s it… you have your hanging birdbath! Depending on the materials you decided to use, it may be a little “unique” to look at, but the birds will certainly appreciate your hard work and effort. Have you ever imagined a backyard that looks like a wildlife paradise of birds? Yes, it is indeed possible. The trick is attracting a lot of different bird species to your backyard, and then feeding them, so they stay longer. One way to attract birds to your backyard is to build bird feeders. Build feeders, of course, should be hung using a, functional, and adjustable pole. This article will give you tips and instructions on how to build a pole for your bird feeders and houses. 1. Plan the dimension/size of the pole – the first thing you need to do is formulate the dimensions of your bird feeder pole. This would include the height of the pole, the distance between joints/holders, the diameter of the holder (pipe), and the pole diameter. 2. Mount a pipe to the ground – Next you should mount the pipe holder to the ground, . Ideal mounting depth is 50% of the pipe’s length or more. You can mount your pipe by using a hammer or any hard object. 3. Solder a simple sleeve – Once your pipe is mounted in the ground, you will now solder a simple sleeve. Make sure to solder it over the end of the pipe, making sure the upper half of the structure can slide in and out of the sleeve and be supported by the pipe mounted in the ground. 4. Plan how many joints you will have on your pole – Decide on how many joints you want to attach to your pole. These joints will hold the arms that will hold your bird houses and feeders. Remember that the more joints, the more times you need to create breaks in your main pole. So, if you decide to have three joints, then you must create three breaks in your pole. 5. Prepare your joints – Drill a hole in the bottom of each arm about an inch from the end. A hole should be drilled large enough for a deck nail shaft to fit, but not the head. Taking a pair of vice grips, the nails are bent so the pointed end acts as a hook which can be fed through the inside of the hole drilled in the pipe so the nail hook is suspended by its head and can spin freely. 6. Attach the holders (which are attached to joints) to your main pole – slide your joints with arms in your pole perpendicularly, then stand the pole to the pipe mounted on the ground. You are now ready to hang your bird feeders. Look around your yard or neighborhood. What kinds of items can be used for bird feeders? Do you see a pinecone? Pinecones make lovely feeders because they are capable of holding peanut butter and suet. Your pinecone bird feeder will attract chickadees, nuthatches, titmice, and woodpeckers. 1. Wrap your wire around each of the pinecones you have collected from your yard. You will need to slip the wire under the second or third tier of scales from the stem end (your pinecone will be hanging upside down). Once you have wrapped the wire around the scales, you will need to knot the wire to make sure it is secure. Allow approximately 6 to 12 inches of slack for hanging. 3. Mix equal amounts of peanut butter and cornmeal together. Do this until it looks well blended. Then use your tablespoon to spread the peanut butter/cornmeal mixture on each pinecone. Make sure to allow one or two small sections of the cone to remain free of the mixture. This free space will give your bird visitors a perching area. Use the knife to push the mixture deep between the scales of the pinecone. 4. Lastly, hang your pinecone bird feeder from a sheperd’s crook or low tree branch. Bird’s will love this one! Not only will they love the bird food, but you have created a feeder that blends well into their natural habitat. This bird feeder project is also lots of fun to share with your children. They can hunt for the perfect pinecone, help create your peanut butter mixture, and enjoy watching the birds who are attracted to this feeder. If you have any requests for blog postings, please leave a comment below. Thank you! Source: Projects for the Birder’s Garden. This is my kind of birding project… it’s not rocket science, it’s simple, and quick! Whenever building a feeder at home it is usually beneficial to mimic the natural habitat of the bird you are attempting to attract to the birdfeeder. It therefore becomes important to learn how a woodpecker typically feeds in the wild. Woodpeckers are considered “clinging” birds – they have clawed toes that point in opposite directions which gives them the ability to cling and walk vertically up a tree trunk. Woodpeckers perch vertically to forage for food in trees which is exactly why we are going to hang our feeder vertically on a nearby tree. Obtain a rectangular cedar shingle. Cedar is best because it is thin and sturdy. Since peanut butter is high in oil – you many want to wrap the back of the cedar shingle with aluminum foil to prevent the peanut oil from seeping all the way through the shingle. Simply nail the shingle to a vertical support. This support can be an arbor post or a feeder mounting post. The shingle should be nailed as high as you can reach without using a ladder. Spread your chunky peanut butter near the top of the shingle so the woodpeckers have room to grip without smearing the peanut butter on their feet or tails. Keep in mind, woodpeckers will not be the only interested parties. Other clinging birds such as nuthatches, titmice, and chickadees will probably partake as well.